MADRID — Valencia maintained their pursuit of Barcelona to remain four points off the La Liga leaders thanks to second-half goals from Geoffrey Kondogbia and Santi Mina to beat a luckless Espanyol 2-0 on Sunday. A club record eighth straight La Liga win for Valencia moves Marcelino Garcia Toral’s men six points clear of Real Madrid in third and sets up a mouthwatering top of the table showdown at home to Barcelona next Sunday. "We want to beat Barcelona to be as high in the table as we can, but we still can’t talk about being candidates to win the title yet," insisted Valencia assistant coach Ruben Uria, who faced the media after Marcelino was sent to the stands in the second half. 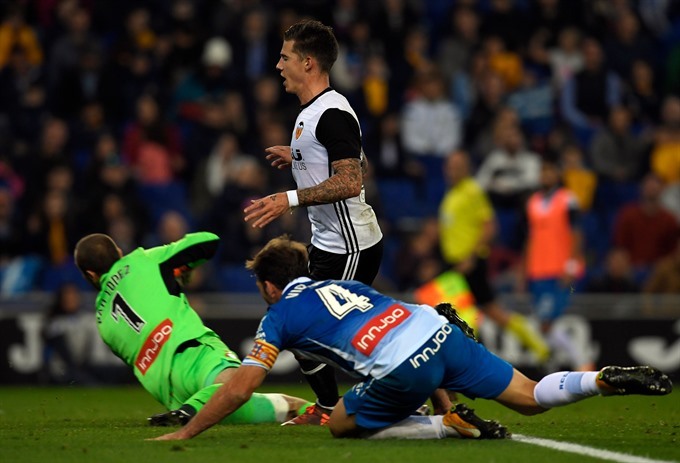 Valencia’s goalkeeper Neto also had to show smart reactions to deny Sergio Garcia and Moreno once more as Espanyol looked the more likely side to make the breakthrough. However, a moment of magic from Kondogbia swung the game Valencia’s way 23 minutes from time as he curled home a wonderful strike from 25 yards. And Mina pounced on Victor Sanchez’s short back-pass to calmly side-foot past Pau Lopez on the volley to secure all three points.